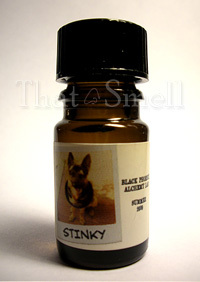 Stinky is the scent whose name invokes the spirit of dogs everywhere. At one point in almost every dog’s life he or she has been stinky but Stinky by Black Phoenix Alchemy Lab smells like everything but dogs. In Bottle: Sweet and stinky honey layered over soap and powder. Smells a lot better than I make it sound. For one thing, the honey is a well blended matter as if it’s a honeyed bar of soap resting next to a pot of fluffy white powder. Applied: The honey is the first thing that I smell, it gets a bit sharp on the initial application before it mellows out a little as the scent ages on me. But for the first hour or so, it smells like warm, sticky honey with a clean background. As Stinky ages, the clean background of soap and powder comes up a bit more and the honey takes a few steps back. It will remain present as the fragrance continues to age and starts to fade with the soapy smell going away the quickest, leaving a powdered, warm and sticky honey type of scent lingering until it all dissolves into nothing. Think honey-scented powder and you’ve got Stinky. Extra: Stinky was released in 2009 in and around the summer months as a celebration of mud-covered and mischievous dogs. In particular, the dog featured on the label. Design: Stinky is bottled in much the same way as other Black Phoenix Alchemy Lab fragrances. Held in an amber apothecary bottle, Stinky sports a cute Limited Edition label with a photograph of the dog which inspired this scent. Notes: milk, white honey, baby powder. Leave it to Black Phoenix Alchemy Lab to come up with a fragrance that pretty much defies any sort of fragrance family. Reviewed in This Post: Stinky, 2009, 5ml Bottle. This entry was posted in black phoenix, gourmand, Reviews By House and tagged black phoenix alchemy lab, bpal, clean, dogs, honey, milk, powder, soap, stinky, summer. Bookmark the permalink. I will take a look at this in Opera and see if I can recreate any problems and hopefully get this fixed. Thanks for letting me know! Edit – I took a look using Opera 10.63, using Windows XP SP3 and the site works fine. Perhaps you need to update your browser? I’m sorry, I can’t seem to find anything wrong. 🙁 Hopefully if anyone else reports problems I can get a better idea of what the problem is and remedy it. Thanks again.